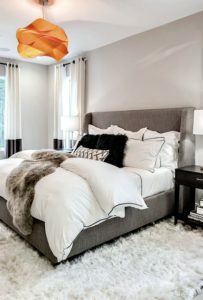 The bed is the most important element of a bedroom. 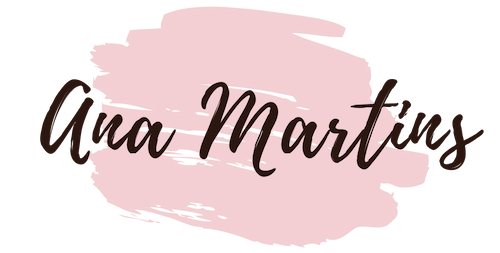 Not only is where we sleep, and just for that reason should be super comfortable, but it also very often the focal point of the room, so for me it’s super important to make it look pretty and extra cosy. 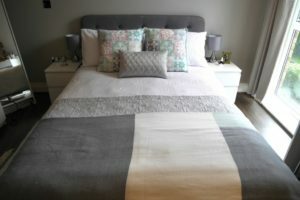 A few years ago I used to only use a bedspread in my bed, and even thought it looked nice it never looked as cosy as the beds in the magazines and on Pinterest. I came to realize that using a duvet played in important role when it comes to making a bed look extra cosy. Using a duvet makes your bed look puffy, so you should get a duvet depending on the puffiness you want for your bed. There are a lot of stores and brands that sell duvets, mine is from Primark and honestly, I love it! I bought the puffiest one I could get, it’s cheap, good quality and keeps me extra warm during the winter months. There is also a lot of different ways you can style your bed with a duvet. You can use it to cover the whole bed (like I do it) or you can use it folded on the foot of the bed. Either way look really good. 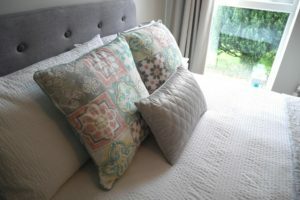 I love cushions, I could have my bed and my sofa covered in cushions if my husband wasn’t the complete opposite of me! Anyway, cushions are super important when it comes to making your bed extra cosy. 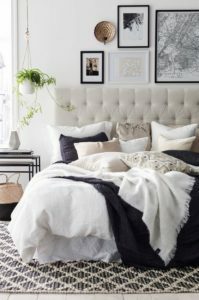 This doesn’t mean you have to have 50 cushions on top of your bed, but don’t have only two either…find the right balance for your style. I have 2 white pillows (2 are the ones that we sleep with), and other 2 white ones to add comfort and volume. I then have two cushions that are more decorative and one last small one in the front of the others that is also decorative. 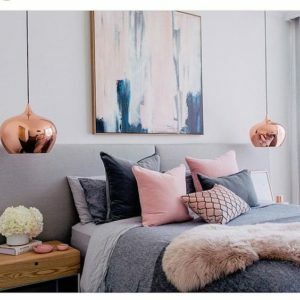 You can use cushions to style your bed in many different ways, you don’t have to do it my way, so look at these few examples. Adding layers is probably the most important step to making your bed look extra cosy. If you only have your duvet and your cushions, you will notice something is missing! 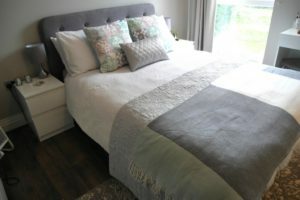 Again, if you look on magazines or on Pinterest, cosy beds have always at least two extra layers, usually with throws or blankets at the end of the bed. You can opt for only having one blanked and it will still look good, but if you want to go the extra mile then add at least two layers. I have a throw and a blanked and I love the way it looks. 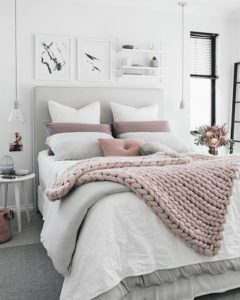 I personally live white bedding combined with pastel colours, but you can like something different and opt to use stronger colours. Just make sure they all go well together and that you don’t mix too much. Super cosy beds aren’t cosy just because they have layers and comfy duvets, but also because they make you feel relaxed just by looking at them. 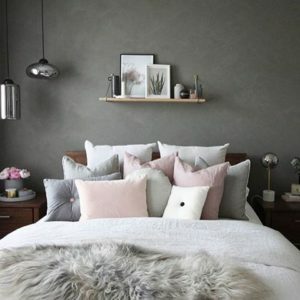 To achieve this, pastel and neutral colours work the best. Look at these examples. This may not influence how your bed looks, but it definitely influences how you feel while laying in it. 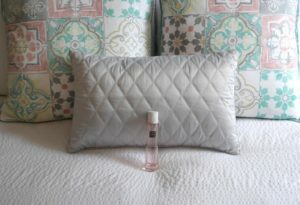 I love this Rituals Bed and Body Mist. My favourite scent is cherry blossom, is so good and relaxing! I spray it in my bed before I make it, and on my cushions after the bed is made, and then when I go to bed at night it smells so good under the covers, and it just makes me feel extra cosy.